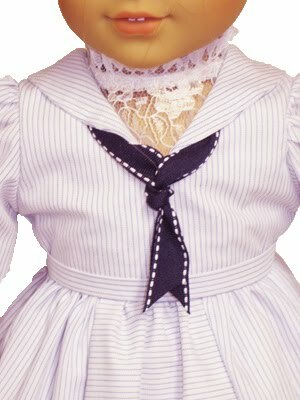 This was inspired by a costume seen in the period film 'Anne of Green Gables'. It is hard for a picture to do justice to the tiny details of this dress. The striped fabric is used in such a way that the stripes are used to their best advantage to make the design. The pinstripe fabric is so small that it is difficult to see the stripes in the full-length picture. 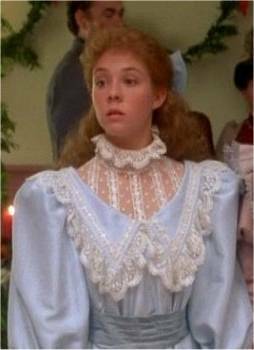 Many will recognize this dress from the popular movie, 'Anne of Green Gables'. This is based on Anne's ball dress that Matthew gave to her for a Christmas present. If you have not seen this movie, I highly recommend the version from Sullivan Entertainment starring Megan Follows. The picture does not do this beautiful dress justice! The basic style of this dress is fairly common in Edwardian clothing. 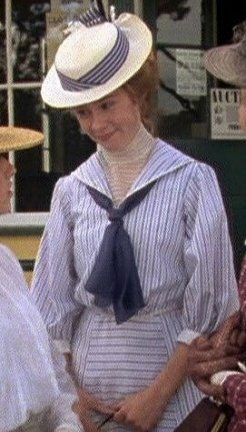 A sheer collar was commonly worn underneath dresses to give them a 'layered' look- very similar to the popular layered style today. Click here to visit the page for this dress for more information. Also, don't forget to click through the site to see the other new designs! Another sneek peek at new designs! 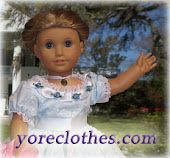 A pink Victorian dressing-gown to complement our Victorian Nightgown. 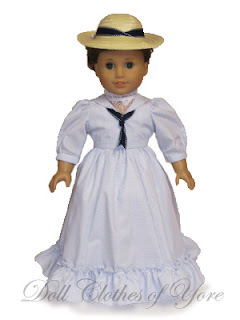 2010's Civil War 'Carolina Button Dress' is back! This time the dress features a navy cameo as a bonus decoration! 1940's swing dress- ruffles, polka dots, and lace! 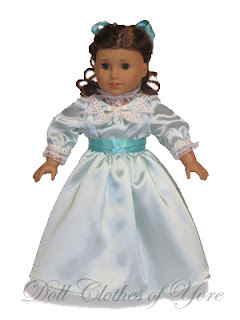 The light green ball gown from Anne of Green Gables is coming! It features pearl trim, real Venise lace, mint green satin, and a satin sash! Some of these designs are limited in quantity, so be ready on April 13th!